I gazed at the enticing end papers for as long as I did the cover, and every page that followed. This beautifully illustrated graphic delight is organized as Part One, Part Two, and Part Three. Its about what is and what isn't. About loss, change, growth, and harmony. And perhaps most importantly, the value and spirit of belonging. Vocabulary like merchant, abandoned, luxury, excess, poor, residents, homeless, and important are woven through the text, nudging opportunities for critical discourse and reflection. 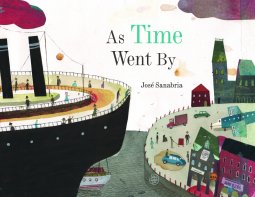 Sanabria has created a narrative that honors the inquisitive curiosity and innate wisdom that children bring to their interactions with picture books. Readers of all ages will appreciate the art, the fluency of the words, and the abundance of symbolism throughout.